20-0 win for U15s v Worcestershire! Leicestershire Under 15s travelled to Worcestershire for the third match of their Shires League campaign. Could the team get back on track after the defeat against Yorkshire? Time would tell. Team Managers, Mark and Laura set out their game plan, in their pre-match team talk, before the mixed doubles got underway. First up, Martin and Ella, Tom C and Hritika, Ryan and Eve, Tom L and Issy. The sports hall went quiet as the pairs went into action and despite the fact that it was Worcestershire that won the first rally of the day, it was Leicestershire that dominated the early proceedings. First to turn were established pair Martin and Ella, quickly followed by Tom L and Issy. However, the first Leicestershire pair to win their match and claim that confidence boosting first team point were Tom and Hritika with a convincing 21-9, 21-7 victory. Next to take their points for Team Leicestershire were Martin and Ella winning 21-10, 21-17 and Ryan and Eve winning 21-18, 21-14. Not for the first time, the team succeeded in achieving a clean sweep in the mixed with Tom L and Issy winning their first game 21-10 and coming through a tight second game 21-19. Next up, the first singles matches and it was Ella off to a fast start, keeping her opponent moving around all areas of the court winning the first game 21-11. Hritika with some equally strong play using some excellent tactics clinched her first game 21-12. It was a mixed start for the boys with Leicestershire number 1 Martin losing his first game 21-19, however it was good news for Tom who won his first game. Tom continued to press his advantage and took the match with a superb cross court drop shot to his opponents forehand side to set up a 21-14, 21-11 victory. By this stage both Ella and Hritika had put in excellent performances to complete victory in their matches. The loss of the first game had woken Martin up and it was a much more focussed player that took the court for the next game. He won the second and third games 21-8, 21-11 to take his point for Leicestershire. The singles matches continued with Izzy, Eve, Nikhil and Ryan taking to the court for their contests. Both Issy and Eve put in dominant performances maintaining their concentration, both conceding only 14 points to their opponents in their matches to claim their individual points for the team. At the same time, some great movement and skilful touches enabled Ryan and Nikhil to take their points for the team. Ryan won the first five points of his match, never looking back, eventually winning 21-7, 21-13. Nikhil was equally impressive in his 21-5, 21-15 victory. Next, the level doubles and making her first appearance of the day was a smiling Jasmin Bullock who was returning to competitive play after a suffering an injury two months prior. She partnered Ella to take on Worcestershire’s top pairing, whilst Issy and Eve teamed up to take on their opponent number 2 pair. With some sharp net work from Eve and powerful forehand smashes from Issy, the pair dominated the match winning 21-9, 21-3. After a comfortable first game, Ella and Jasmin were made to work hard to claim victory, eventually winning, 21-7, 19-21, 21-16. Tom Lund re-entered the fray, teaming up with Nikhil to take on the oppositions second ranked pair. Tom and Nikhil stood tall at the net and despite some despairing dives from their opponents took the match 21-9, 21-15. Meanwhile, the tried and tested Beynon Cowperthwaite combination worked well together to dispatch Worcestershire’s top pair 21-10, 21-15. In the reverse doubles, one of the performances of the day was served up by Issy and Eve. They played flawlessly in the second game and at one stage won ten successive points to lead 20-2, before taking the match 21-8, 21-5. Within seconds of Issy and Eve claiming their point, Ella and Jasmin also signed off in style winning their match 21-4, 21-7. Meanwhile attacking play from Martin and some disguised slices from Tom C were the highlights of a comfortable 21-7, 21-8 in their final game. However, thoughts of an early departure onto the M5 were dashed as Tom and Nikhil provided arguably the match of the day. Having lost their first game, the pressure was on the players to see if they could deliver a 20-0 victory for the team. 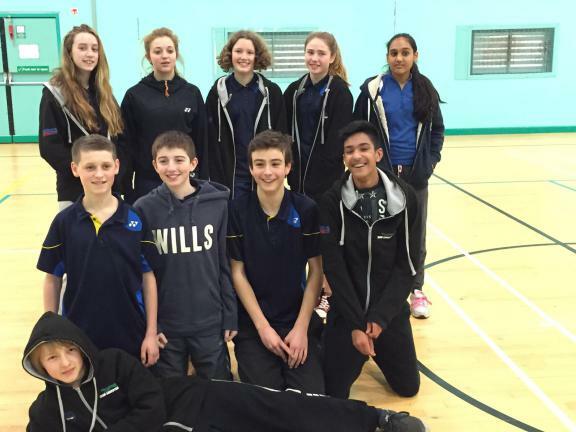 Both pairs played some excellent badminton, with Nikhil in particular covering a lot of ground in defence. After a series of long rallies Tom and Nikhil took the second game, but fell to a 17-13 deficit in the third and final game. With all eyes now on this high quality match both pairs gave 100% effort, but finally it was the Leicestershire pair that triumphed over a Worcestershire partnership that had given their all.